Rich, creamy and oh-so-delicious! 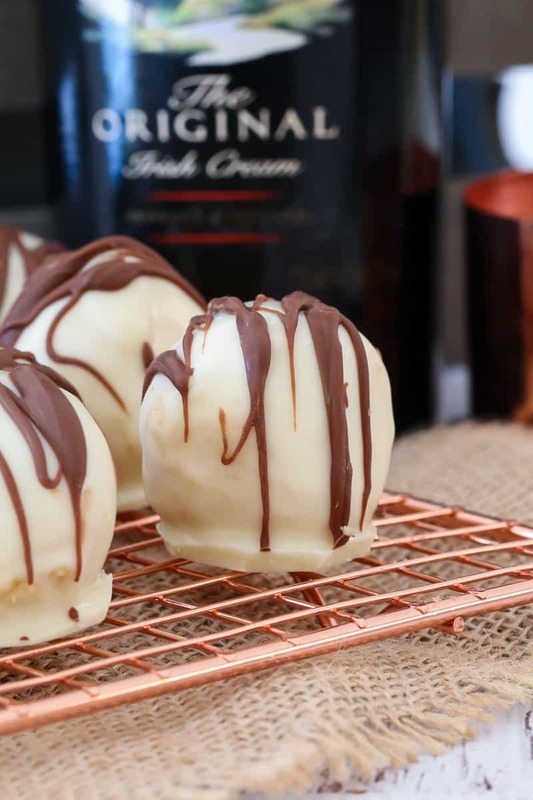 These 4 ingredient, no-bake Baileys Tim Tam Cheesecake Balls are the perfect gift for family or friends… or the yummiest little sneaky late night treat! If you love Baileys, then you’ve come to the right place. If you’re a chocoholic, then welcome… you’re definitely at the right place. 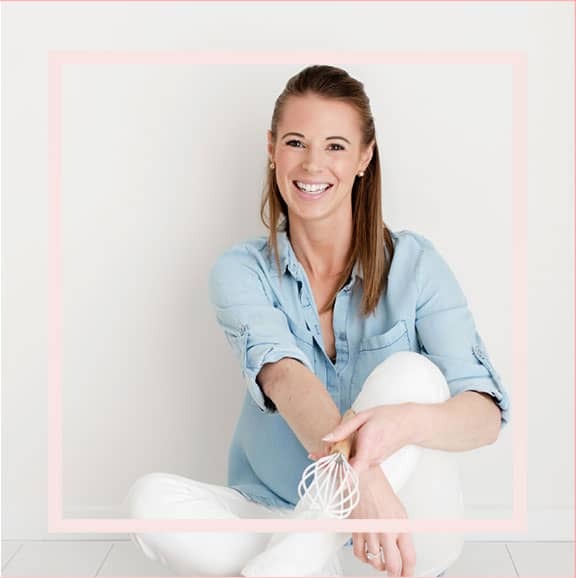 And if you’re a cheesecake lovin’ gal (or guy! ), then OMG you should totally be here. Annnnnddd we should really be best friends, because I love all those things too. High five! 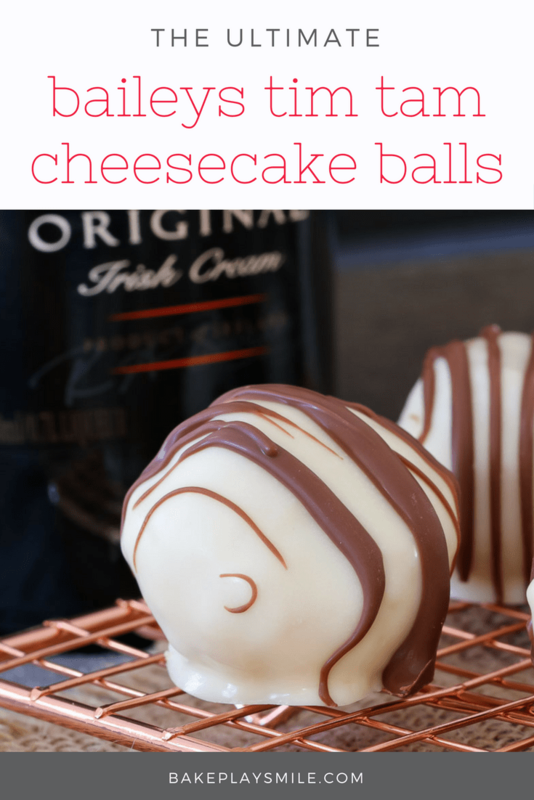 Now let me start off by explaining these Baileys Tim Tam Cheesecake Balls to you in two simple words. FREAKING AMAZING!!! I wish I could make those capital letters even more massive because seriously FREEEEAAAKIIINNNGGG AAAAMMMAAAZZINNNGG. You’ve got the idea, right? I first posted this recipe a couple of years ago.. and ever since then it’s just gone absolutely crazy. There are some serious Baileys lovers out there. And so I decided that it was time to redo the old photos, make a fun little video to show you how simple this recipe is and celebrate the utter deliciousness of these little babies. 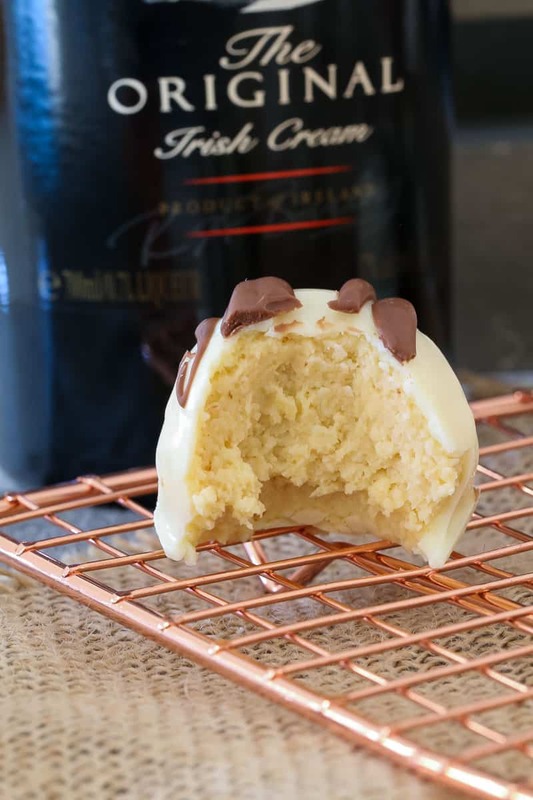 Now I have to say that these Baileys Tim Tam Cheesecake Balls are my all-time favourite version. BUT! If you’re more of a Kahlua lover (totally ok) then check out this version. 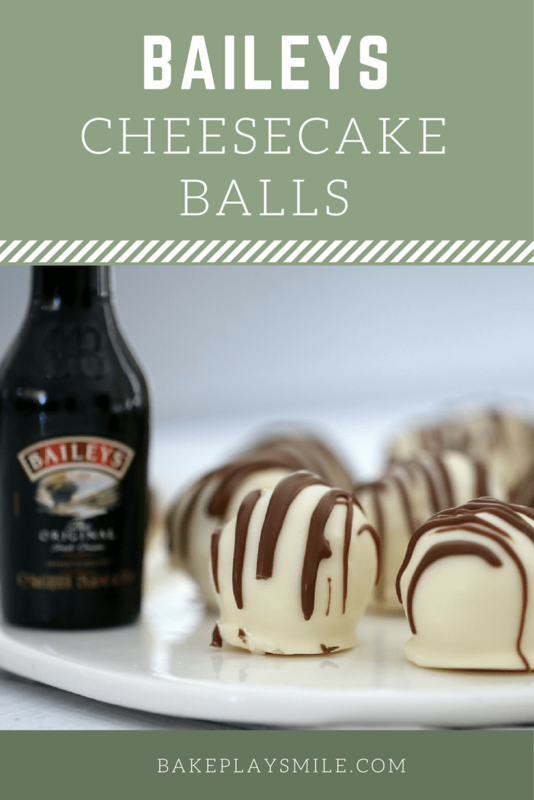 Or if you’re after a non-boozy version, these Caramel Cheesecake Balls are a must. 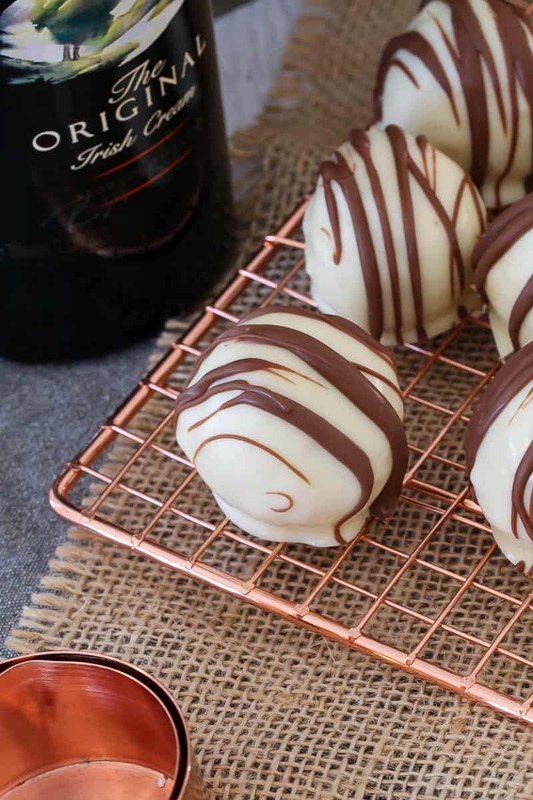 These little balls also make the most delicious present for family or friends. Hello homemade Christmas gifts!! But if you decide to go down the ‘giving away’ route, then pretty please promise that you’ll keep at least 5 of these for yourself. Or 10. Rich, creamy and oh-so-delicious! 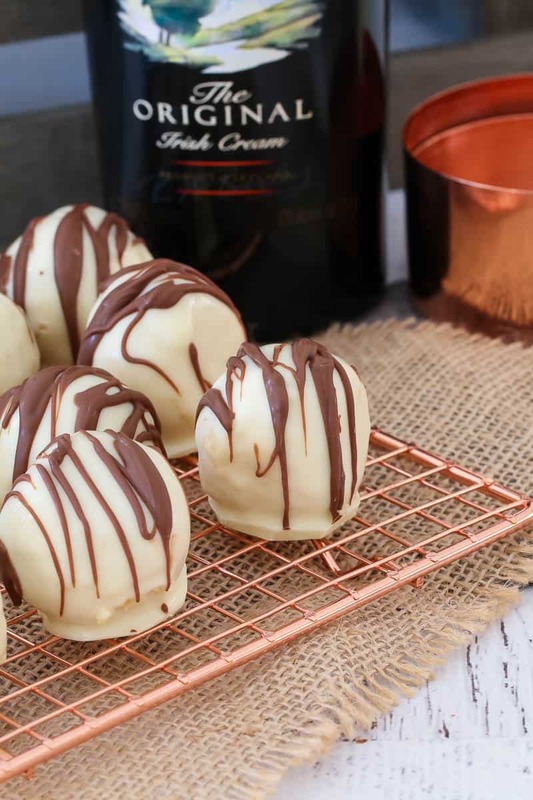 These 4 ingredient, no-bake Baileys Tim Tam Cheesecake Balls are the perfect gift for family or friends... or the yummiest little sneaky late night treat! Crush white chocolate Tim Tams until they resemble fine crumbs. Mix Tim Tam crumbs with the cream cheese and shot of Baileys Irish Cream liqueur. Place into the fridge for 20 minutes to harden. Roll into 1 inch sized balls and place on a tray lined with baking paper back into the fridge for a further 20 minutes. Place white chocolate in microwaveable bowl and microwave on 50% power for 2-3 minutes, stirring every 30 seconds, until chocolate is completely melted. Place the balls into the bowl of melted chocolate (in batches) and use two teaspoons to roll the balls around until they are completely coated. Remove balls with the teaspoons and allow any excess chocolate to drip off. Place back onto the baking paper lined tray. Place into the fridge to set for 1 hour. Drizzle with melted milk chocolate if desired. Tim Tams are an Australian cookie made by Arnott's. If you are unable to buy them, you can substitute them with any other white chocolate coated cookie. For something a little different, you could use Oreos in place of the Tim Tams (this will give you a beautifully dense chocolatey flavour). Place white chocolate Tim Tams into the TM bowl and crush on Turbo until they resemble fine crumbs. Add the cream cheese and Baileys Irish Cream liqueur and mix on Reverse Speed 2 until well combined (scraping down the sides of the bowl occasionally). Roll into 1 inch sized balls and place on a tray lined with baking paper and place back into the fridge for a further 20 minutes. Place white chocolate into a clean TM bowl and melt on 50 degrees, Speed 3, 2-3 minutes, scraping the sides occasionally. Pour the melted chocolate into a bowl. Remove balls and allow any excess chocolate to drip off. Drizzle with extra melted milk chocolate if desired. Awesome post (as usual!) these look fab but I don’t think they would last long enough to be given as gifts! I’m an Aussie in Brisbane, Queensland and made these with Oreos (ha ha!) yesterday to takeover to a friend. My only problem was the humidity here in summer trying to dip the balls in the melted chocolate I had a mess everywhere! However they looked and tasted yummy! I have the Caramel Baileys as well. How long will these keep for OR can they be frozen? OMG YUM!!!! If you’re going to freeze them, I would do so before you coat them in the chocolate. Not frozen they’ll last in the fridge for about 5 days (depending on the use by date of your cream cheese of course!). Oooh the Caramel Baileys would be delicious!! These look too easy and delicious! 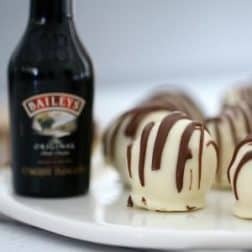 If you were making them for someone who doesn’t drink alcohol what could I substitute the Baileys with? Anything! 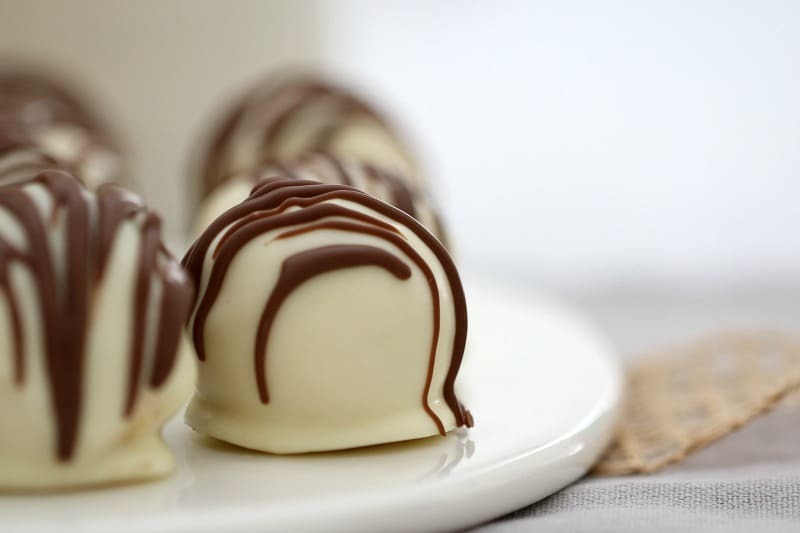 You could just do them as a white chocolate ball, add crushed up peppermint, Milo… anything! They’re so versatile! Milo you can probably use Baileys Creamers, there is no alcohol in it & you will have the baileys flavor. What are “Tim Tam’s” familiar to? I have never heard of them.I would like to try these, but wouldn’t know what to use. Thank you. Hi Barb, Tim Tams are a very famous Australian chocolate covered cookie. You can use any chocolate covered cookie you like though – it doesn’t have to be that particular brand. Hi there, you can use any chocolate covered cookies. Or if you can’t get hold of any, Oreos or great too! I would love to try these but having a hard time finding ”white” choco.Tim Tams. You say to use Oreos, do you mean the vanilla ones? So white chocolate covered oreos would work? I tried to find the white chocolate Tim Tam’s but haven’t been able to. I found some milk chocolate covered Tim Tams. 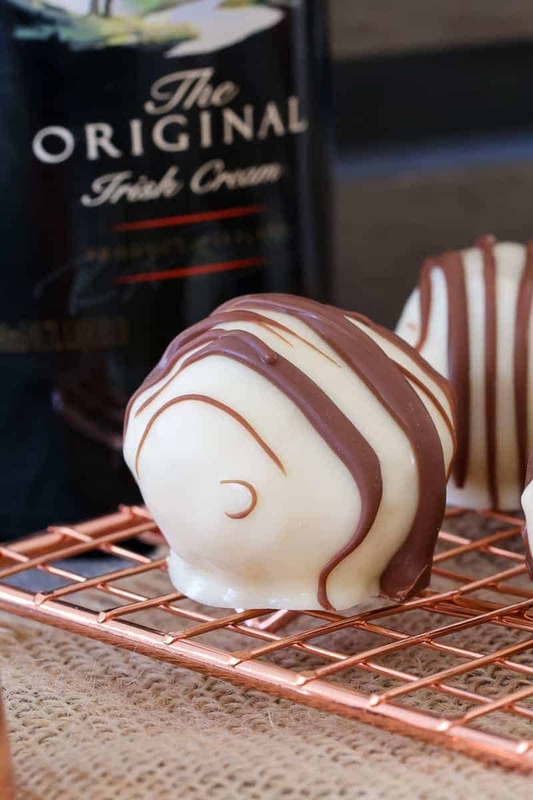 I’m dying to make these, just need the cookies! I have made these with Mint Slice biscuits and coloured the white chocolate pale green and drizzled them with white choc. Makes them minty and extra Xmasy. I found some chocolate Tim Tams here in the US (NY) at Target. In found them in the cookie isle at Walmart. Tim Tams are sold at Target in the US. Not sure if they have the white ones. They are a type of biscuits theatre very popular in Australia. You can use any chocolate covered biscuits you like though! You might want to see if you have a Store called Trader Joes Or A store called World Market, they mey carry the tim tams. or just use oreos. would probably work well. Oh you’ve never tried Tim Tams? Oh God, don’t try them coz they are highly addictive! We love them here in Australia! So many different flavours to choose from.